In a report on the Arizona wildfires on Tuesday's NBC Today, correspondent Miguel Almaguer touted how "The Forest Service says this historic wildfire season is caused in part by climate change." After promoting that politically charged claim, Almaguer declared that Senator John McCain had created a "firestorm" by noting that illegal immigrants have contributed to past wildfires. At the top of the show, co-host Ann Curry proclaimed: "Heated controversy. A debate blows up over John McCain blaming some wildfires in Arizona on illegal border-crossers." 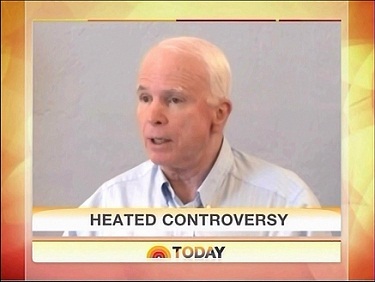 Later, she framed an interview with McCain this way: "Now to more on that controversial comment by Arizona Senator John McCain....We spoke to the Senator earlier this morning. We began by asking him if he was trying to use this current tragedy for a political purpose." McCain explained the context of his comments: "I was not referring to the Wallow [Arizona] fire....the fact is I had just been briefed on this situation by a Forest Service official. And we all know that people who come across our border illegally, according to the Forest Service, according to the Border Patrol, according to the local sheriffs and law enforcement agents, that these fires are sometimes, some of them, have been caused by this." He added that he was surprised by the media attention: "I'm puzzled over that there should be any controversy since the Forest Service is on the record as saying exactly what I just repeated because I had been briefed on that just an hour or so before the press conference that we held." ANN CURRY: Heated controversy. A debate blows up over John McCain blaming some wildfires in Arizona on illegal border-crossers. We'll talk about it with the Arizona senator. SAVANNAH GUTHRIE: And in the news this morning, there's some hope today in Arizona, where crews battling massive wildfires have had some relief from the weekend's blistering winds. But hundreds of residents are still in evacuation centers and dozens of homes have been consumed. NBC's Miguel Almaguer is in Sierra Vista, Arizona, this morning with more. Miguel, good morning. MIGUEL ALMAGUER: Savannah, good morning. Fires are burning across the region but the monument fire is considered the top fire priority anywhere in the country. Today it is still threatening homes and it's on the move. Our first look behind the fire lines outside Sierra Vista, Arizona. The Monument Fire, a wall of flames, has charred 42 square miles, at least 60 homes destroyed. While some were allowed to return home Monday night, 13,000 had been evacuated. Many living in shelters. Arizona, like several drought-stricken states, is a tinder box ready to explode. This year, 4 million acres have been devoured by wildfires nationwide. The Forest Service says this historic wildfire season is caused in part by climate change. But Arizona Senator John McCain created his own firestorm Saturday, saying undocumented immigrants may be behind some of the blazes. JOHN MCCAIN: They have set fires because they want to signal others. They've set fires to keep warm. And they have set fires in order to divert law enforcement agents. ALMAGUER: A spokesman for the U.S. Forest Service says there's no evidence to support McCain's claim. The National Guard will join members of firefighting teams here at the Monument Fire. The good news, calm weather is expected through the day. Savannah. GUTHRIE: Alright, Miguel Almaguer in Sierra Vista, Arizona this morning. Miguel, thank you. ANN CURRY: Now to more on that controversial comment by Arizona Senator John McCain that illegal immigrants may be behind some wildfires in his state. We spoke to the Senator earlier this morning. We began by asking him if he was trying to use this current tragedy for a political purpose. JOHN MCCAIN: Well, I was not – I was not referring to the Wallow fire. Obviously it was part of the question/answer period during a press conference. And the fact is I had just been briefed on this situation by a Forest Service official. And we all know that people who come across our border illegally, according to the Forest Service, according to the Border Patrol, according to the local sheriffs and law enforcement agents, that these fires are sometimes, some of them, have been caused by this. And so, again, I'm puzzled over that there should be any controversy since the Forest Service is on the record as saying exactly what I just repeated because I had been briefed on that just an hour or so before the press conference that we held. CURRY: I'm going move on to another major story that's making news now. And that's the President's expected planned drawdown of troops from Afghanistan next month, and especially in light of Bin Laden's – the killing of Osama Bin Laden. This morning, the L.A. Times, quoting unnamed – multiple unnamed administration officials, as saying the President expects to bring 10,000 troops home by the end of this year. And this is while General Petraeus has talked about 3,000 to 4,000. How much is too many? Is 10,000 too many to you, Senator? MCCAIN: Well, first of all, I'd like to examine the number that the President comes forward with. Secretary Gates has been very clear and very emphatic that a, quote, 'Modest withdrawal is in our best interest.' I obviously would like to know exactly what General Petraeus' recommendation has been, as well as other military leaders. But – so I'd like to make – wait to make a judgment. But if there are support troops, I think that that is somewhat acceptable. If they come out of the 30,000 surge, then I think that's a matter of concern. CURRY: Meantime, I'd also like to ask you about something that the GOP front-runner Mitt Romney said. He raised some eyebrows, saying, quote, 'We've learned that our troops shouldn't go off and try and fight a war of independence for another nation. Only the Afghanis can win Afghanistan's independence from the Taliban.' Do you think the GOP front-runner made a mistake with those comments, sir? CURRY: House Speaker John Boehner – I know I'm going on a lot of different topics. But a lot of stories are making news. CURRY: And other members of your party are saying that the President needs congressional approval now to continue war operations in Libya. It's been three months. Do they have a point there? MCCAIN: Oh, I think they have a very valid point. I wish the President, also, by the way, would speak more to the American people about the Libyan situation. Qadhafi is crumbling. He will go, in my view. Unfortunately, because U.S. assets were not used to any effect on that situation has been prolonged with needless deaths and casualties. But the President clearly has engaged the United States in hostilities and John Kerry and I have a resolution that we're going to be bringing to the floor as soon as possible. CURRY: Alright. And last question this morning, Senator. And it's about the presidential campaign. You know the latest numbers, the NBC News/Wall Street Journal poll found that just 45% of Republicans are happy about the current crop of candidates on the Republican side. Would you consider – would you be tempted to jump into this race if those numbers held true as we move further down the road? MCCAIN: Ann, there's a long history of masochism in my family, but not so severe as to make me want to jump in again. CURRY: That's the final word then, sir? MCCAIN: Final word. Thanks for having me on, Ann. CURRY: It's great to talk to you Senator John McCain. Thanks so much.